Harrison, A, Jones, L, Entwisle, D, Hulbert, A, Lark, M, Mansour, M, Richardson, J, Wang, L, and White, J. 2018. 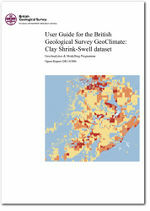 User guide for the British Geological Survey GeoClimate: clay shrink-swell dataset. British Geological Survey. (OR/18/006). This page was last modified on 25 June 2018, at 10:20.